Environmental Safety Consultants Services - Environmental Safety Consultants, Inc.
Environmental Safety Consultants provides a diverse range of services in the environmental and safety fields. This offering is based on staff’s education, training, licenses, certifications, and experience. If there is a service we do not offer, we probably can refer you to a firm that does. Environmental Safety Consultants’ services are concentrated in four areas. These are Building Testing, Environmental Permits and Testing, Industrial Hygiene and Safety, and Property Assessments and Cleanup. So let’s start with Building Testing. What does that include? Well, just about everything, such as asbestos bulk building materials and air, lead based paint, mold, indoor air quality, radon, volatile organic compounds (VOCs), dust or particulates, and more. You may need the testing for things like renovation, demolition, or occupant exposure. The next one is Environmental Permits and Testing. The permit areas include air emissions, industrial wastewater, and NPDES stormwater, among others. Testing may include visible emissions, industrial wastewater discharges, and stormwater. Surface water may also require testing to investigate background conditions of receiving waters. What services does Environmental Safety Consultants offer in Industrial Hygiene and Safety? Well, things such as concentrations of chemicals and particulates in air are tested to determine worker exposure levels compared to Permissible Exposure Limits and Threshold Limit Values®. Noise monitoring is also completed. On the safety side, ESC provides services in respiratory protection and hazardous materials (Hazard Communication). And last but not least is Property Assessments and Cleanup. 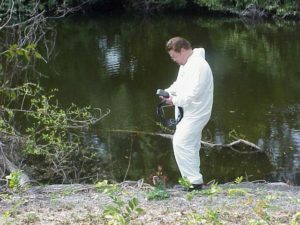 This includes Phase I Environmental Site Assessments as part of a buyer’s due diligence in determining if a site is or could be contaminated prior to purchasing it. If the latter is shown to be true or potentially true, a Phase II Environmental Site Assessment is designed to confirm or refute the contamination in the soil, groundwater, or both. Also, in this group are contamination assessments for underground and above ground fuel storage tanks, dry cleaning fluids, used oil, and more. And, of course, remediation or cleanup. Read on! There is a wealth of information on Environmental Safety Consultants’ web site.